The 25,000ft2 unit is the first new build store that ISG has taken on for Sainsbury’s and follows a long-standing relationship that has involved numerous refurbishments, extensions and feasibility studies. Originally planned with a conventional steel-frame design, it was re-specified as a timber-framed building following planning approval. 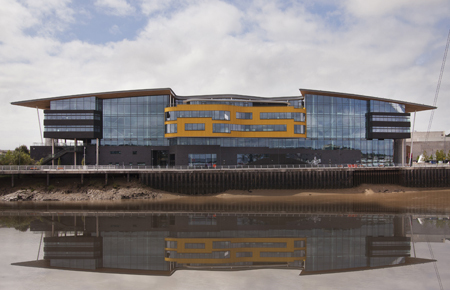 The client’s sustainability demands continued to broaden even after the design and build project was well underway, challenging ISG to provide solutions that were both environmentally sound and economically viable. The BREEAM ‘Very Good’ rated scheme is targeting a carbon neutral build thanks to its timber frame, pre-fabricated SIPS (Structurally Insulated Panel System) timber walls and timber roof cassettes finished in larch cladding, all of which are derived from renewable sources. 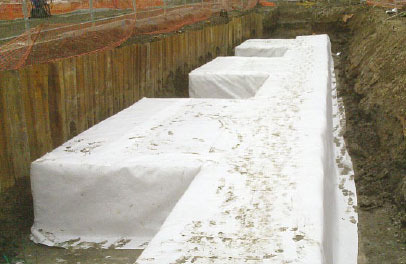 The SIPS walls, designed to provide integral vapour barriers, have also enhanced the efficiency of the building envelope, delivering an air loss average of just 2.0m3/hr/m2: with an industry norm of 10.0m3/hr/m2. 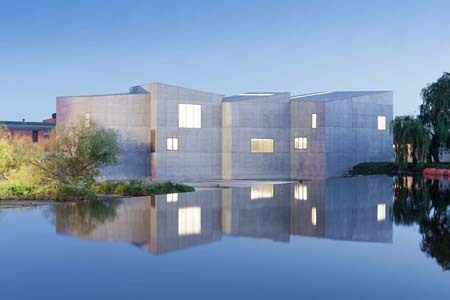 The exemplary environmental performance of the building’s structure is mirrored by the eco-friendly specification throughout. 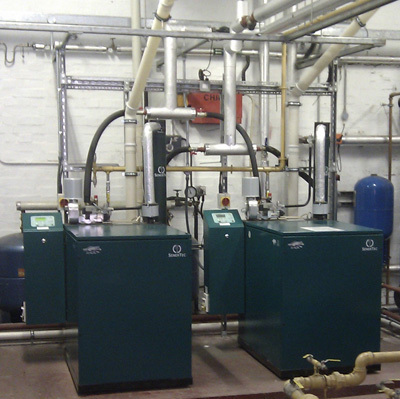 Environmental features include a biomass boiler powered by waste wood pellets, rainwater harvesting and re-use for toilet flushing, LED lighting, the installation of sun pipes and daylight sensors, as well as night blinds on chiller doors to prevent cold air loss into the aisles. Externally, the store even offers charging points for electric and hybrid vehicles in the car park and a storm water drainage system, next to the store, has been planted with 40 species of native trees and shrubs to create natural habitats and encourage wildlife. 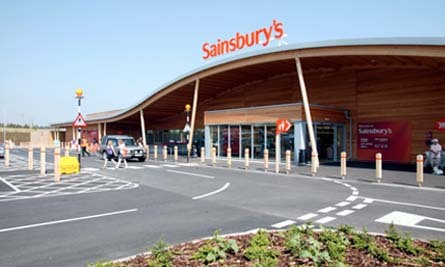 Rob Martin, ISG’s operations director of UK Retail, said: “We have been among a handful of Sainsbury’s preferred contractors for some time, so winning the design and build contract for one of the company’s ground breaking ‘eco’ stores is a massive coup for ISG. Regional developer Cawrey Homes has specified Swish fascias, soffits and cladding in hazy grey for its new eco development, Fielding Meadow. The Leicestershire-based house builder is now in the closing stages of the 36 home development in Ratby. The two-, three- and four-bedroomed homes have been designed to incorporate the latest energy saving technology to achieve a Code for Sustainable Homes level four rating. 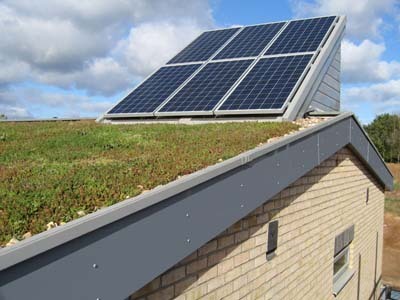 Also including a focus on long-term maintenance savings, the properties feature low maintenance fascias and soffits from Swish Building Products and external cladding, used by Cawrey to house solar panels. Dave Walgate, Buyer for Cawrey, said: “We wanted a development which delivered significant energy and lifetime savings at a sensible cost. More broadly, the development features air source heat pumps, thermally efficient windows, insulated floors and ‘green’ sedum roofs. “We put a lot of emphasis on the building envelope and energy efficiency for example, increasing cavity wall insulation from 75mm to 200mm but also looked at the long-term maintenance costs of the properties. Swish Building Products recently joined a handful of companies that have secured the responsible sourcing standard BES6001 delivering instant point gains to house builders under the Code for Sustainable Homes and Eco Homes. 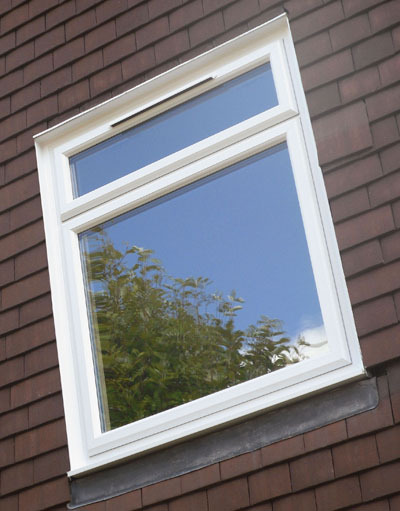 In securing the standard across its PVC fascia, soffit, cladding and window board ranges Swish Building Products is able to offer developers maximum points under the Code (tier level 1), matching FSC timber specifications in Mat2 and Mat3. 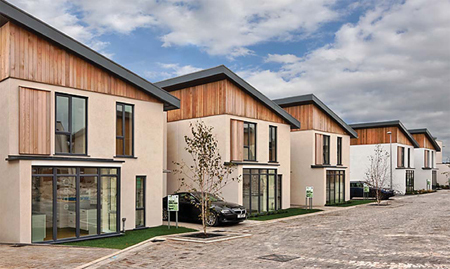 Wakefield and District Housing (WDH), a registered provider with more than 31,000 homes, opened the doors to Park Dale, the UK’s largest zero carbon housing development at the official launch event earlier this month. 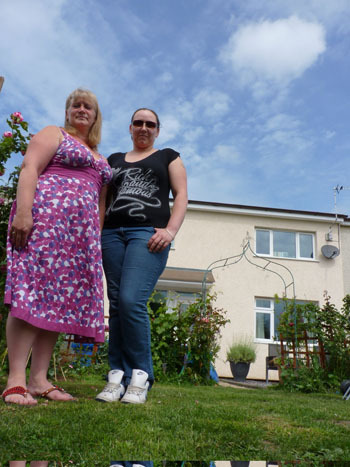 Working closely with community regeneration specialist Keepmoat and property design and management consultants NPS, the pioneering £12 million project consists of 91 homes to Level 6 of the Government’s Code for Sustainable Homes. From the outset Park Dale, in Airedale, West Yorkshire, was designed to offer a realistic and affordable solution to achieve zero carbon at large scale. 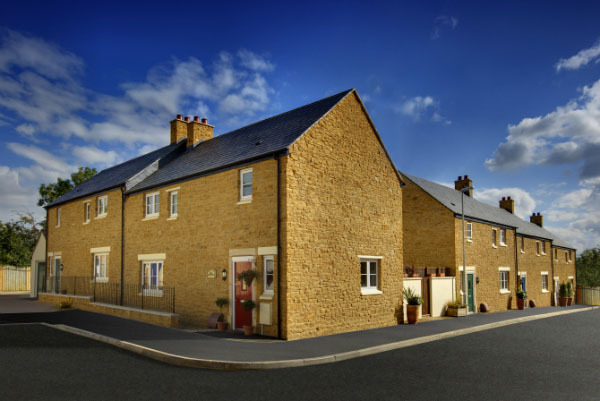 To keep costs down, Keepmoat used block and brick work to achieve superior air tightness, rather than the prefabricated methods of construction conventionally used in zero carbon build. 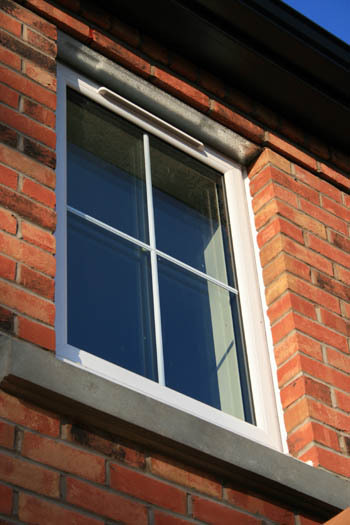 In turn, the use of traditional build methods has had a beneficial impact on the local economy, maximising employment opportunities for local trades people. 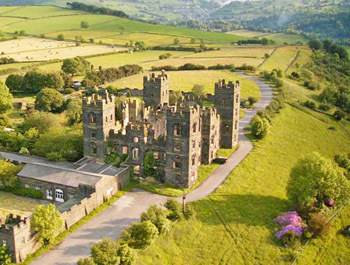 With part funding of £5.77 million from the Homes and Communities Agency, Park Dale includes 71 homes for social rent and 20 for intermediate rent. Each of the two, three and four-bedroom homes uses mechanical ventilation heat recovery systems and has in-roof photovoltaic panels, superior levels of internal air tightness and grey water recycling. The homes draw heat from a district biomass heating system powered by renewable wood pellets produced in Yorkshire from recycled pallets. The development also includes a Learning Centre where residents can find out how to make energy savings and take qualifications in energy management. Park Dale took 12 months to plan and to coordinate the Code for Sustainable Homes submission. Work started on site in March 2010. Trades people from across Yorkshire have worked on the project, many of whom learned new skills in order to build to high standards of energy efficiency. More than 40 apprentices also gained eco-experience on the site during the build. Keepmoat worked with WDH to explore and test renewable technologies to ensure products chosen for Park Dale gave confidence and best value, factoring in long-term maintenance costs. Heating demand is expected to be one fifth of an average home. 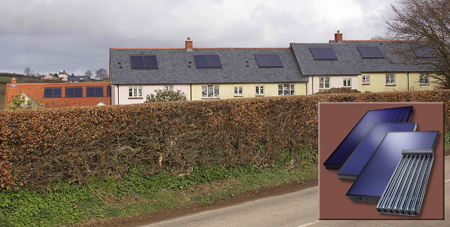 Total energy bills are expected to be 40% less than an average home and 25% less than a modern new build home. Other benefits will include water bill savings from lower water use fittings and grey water recycling, and the potential to save more on bills by using appliances during the day when the photovoltaic panels will power for free. A community hydro-electric scheme is to go ahead after it raised £125,000 in three months from a share issue which gave people the chance to back renewable energy. Esk Valley Community Energy Group aims to establish a small-scale hydro-electric turbine known as an Archimedes' screw on the River Esk in Ruswarp, near Whitby, North Yorkshire. The project attracted enough social investment, in the form of loans and grants, to make the directors approve the next phase. When the scheme is completed in summer 2012, the ‘fish-friendly” turbine will generate around 200,000 kWh of sustainable energy a year, saving an estimated 3,000 tonnes of carbon emissions in its lifetime. Colin Mather, retired civil engineer and chair of the energy group, said: "One of our sayings is 'think global, act local' and our scheme offers people a chance to do their bit to protect the environment while generating a new source of sustainable green energy. "We are delighted with the response to the share issue and although we know that there is still a lot of hard work ahead, it illustrates that by working together, co-operating, amazing things can be achieved." The community share issue is still open, with shares available from as little as £250 up to a maximum of £20,000, to allow the group to reduce loans. A recent report by YouGov found that 42% of Brits with private wealth want to get involved with ethical and social investment. Designed by architects Lovell Ozanne and Partners, the Hougue a La Perre housing development is situated on the northern outskirts of St Peter Port and is managed by Guernsey Housing Association. 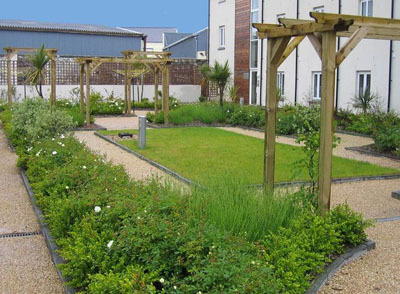 The project involves the development of 77 houses and flats constructed in 2009 on the site of the former Grand Bouet bus depot for Guernsey Housing Association in partnership with the States of Guernsey Housing Department, in order to create a sustainable and attractive neighbourhood. 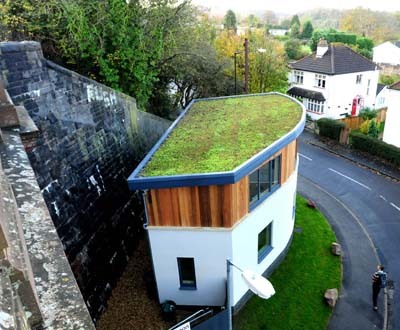 The ZinCo green roof from Alumasc was specified for the podium deck above an underground car-park, which forms a courtyard for use by the residents. The 1200m2 intensive green roof will offer notable ecological and amenity benefits, providing a natural habitat for plants and wildlife, while helping to reduce air and noise pollution, cutting carbon emissions and assisting with rainwater retention and attenuation. ZinCo green roofs vary from extensive and biodiverse types which require minimal irrigation and maintenance, to intensive roofs such as the one at Hougue a La Perre, which are suited for areas of public and recreational use and require more tending. The roof was installed over Hydrotech MM6125 structural waterproofing, also from Alumasc. The Main contractor on the Hougue a La Perre project was Charles Le Quesne (Guernsey) Ltd.
A Nottinghamshire local authority, which won the 2011 Low Carbon Council of the Year award, is the latest to upgrade to ‘intelligent’ energy-saving lighting from Chalmor for two of its largest town centre car parks. Mansfield District Council is making savings of £22,569 and 132.88 tonnes of CO2 per year by using Chalmor’s low energy lighting with motion and photo controls. This has been installed in the Four Seasons shopping centre car park and the Walkden Street car park, which jointly offer 936 parking spaces. Mansfield’s climate change officer, Helen Bartle and colleagues saw Chalmor’s latest low energy lighting demonstrated at the ESTA (Energy Services and Technology Association) exhibition in Manchester last year. Chalmor’s ‘smart’ lighting and controls are operated by time controls, outside light levels and occupancy sensors or any permutation of the three. 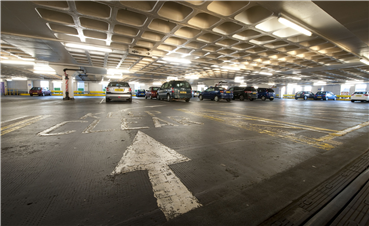 The company’s Refit T5 system, installed at both these Mansfield town centre car parks, replaces older fluorescent fittings by the latest new generation T5 fluorescent technology offering cost savings and reducing energy consumption. The T5 fluorescent lamp technology consumes less energy and depreciates little over its lifetime – 6% compared to 30% over the former lighting. Each of the car parks uses one of Chalmor’s Autolux six-channel controllers and two weatherproof light level sensors to maximise energy-savings by making use of daylight and time sensors. Autolux is also temperature-sensitive and this is used to switch perimeter lights back on again when the temperature reaches zero. Autolux also controls the roof and perimiter lighting that were not replaced to keep these lights off during the night when the car parks are closed. A sure-footed solution to accessing environmental education in Yorkshire has been made possible with boardwalks ‘more sustainable than wood’ – made entirely from recycled plastic carrier bags and bottles. 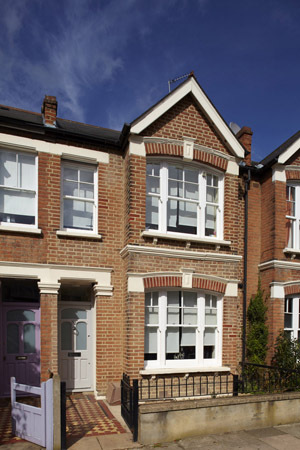 Using recycled plastic profiles instead of wood provided a more durable and maintenance-free solution that was also more practical to design and build, explained Hugh Roberts from Environments for People. “During construction, the recycled plastic is very forgiving,” continued Hugh. “The Centriforce profiles do not deform, chip or split. A treated wooden post can easily split when driven into the ground causing rot and leaching chemicals into the soil; a recycled plastic post is completely inert. Miller Homes has built five identical Miller Zero houses to different levels of the Code for Sustainable Homes in Basingstoke. These homes, which are the same in layout to others on the site of 79 units, have been completed to Code levels 1, 3, 4, 5 and zero-carbon 6. The CfSH houses are among 79 homes for sale on this development. Miller had planning permission for these houses based on 2006 Building Regulations; but as an R&D project, it was decided to construct some of these homes to various levels of the Code for Sustainable Homes. The company wanted to know what the development costs would be between each of the Levels and how much consumers would be prepared to pay for homes created to the Code for Sustainable Homes. 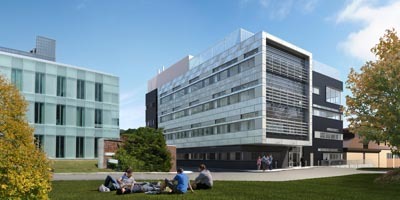 Building as cheaply as possible was not a consideration for Miller, it was about achieving the different Code Levels using different types of materials and construction methods. The company also realised it would be the first time that any house builder would test this decision on the open market. Having tested how the additional construction costs compare, Miller Homes is now researching the public appeal of homes built to different levels. Once sold, each of the homes will be monitored by Miller (with the approval of the owners) to collect data on their lifestyles. The model can then be value-engineered towards possible future sites nationwide. The Code level 6 home is super-insulated with the external walls built using H+H’s 200mm Vertical Elements. The Elements themselves have excellent thermal insulation properties = 0.11 W/mK with a compressive strength of 3.0 N/mm2. The Vertical Elements in combination with 200mm Webbertherm insulation and render achieved a U-value as low as 0.09 W/m2K. Excellent levels of airtightness were also achieved to help meet the mandatory heat loss parameter required for Code 6 Homes of 0.8 W/m2K. This is aided by the fact that the Vertical Elements’ larger panel surface areas of aircrete mean fewer joints, higher levels of air-tightness and improved speed of build. The extra costs of all the Code level homes was identified almost entirely from the addition of the renewable technology required such as a ground source heat pump and photovoltaics, rather than the fabric of the buildings. • The Code 3 house cost between £5,000 and £7,000 more than a house typically specified to meet the Building Regulations. • The Code 4 house cost between an extra £7,000 and £10,000. • The Code 6 house’s cost to build however was £50,000 more. Miller Homes wants to work closely with the occupiers to understand what the impact, if any, the code-home features. Tarkett iQ Megalit vinyl tiles were installed throughout the new single storey extension of the Law School at Newcastle University. Megalit is one of Tarkett’s iQ floorings. Made with high quality raw materials, iQ Megalit needs no wax or polish throughout its life, with a third generation PUR reinforcement that requires the absolute minimum of heavy, wet cleaning. Thanks to its Unique Surface Restoration, simple dry buffing will fully restore the flooring surface to its original appearance and properties, minimising maintenance costs. 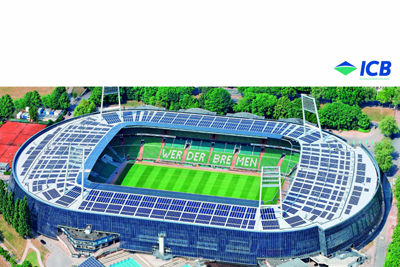 The reduced use of water, chemicals and energy add to its excellent environmental profile. iQ Megalit is also one of the first homogeneous floorings to achieve the highest wear group classification, class T, EN660-2, ensuring it can withstand heavy daily traffic. 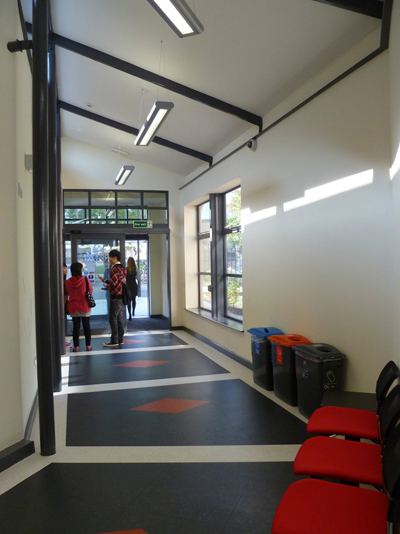 For the entrance to the Law School, contrasting wall and floor finishes were used to comply with DDA requirements. A mix of dark colours and lighter borders were employed for the flooring in circulation routes, with the colour scheme designed to reflect that used in the garments of the judiciary. The Hicks Lodge Cycle Centre project, completed by Robert Woodhead for the Forestry Commission, achieved second place in this year’s EMCBE (East Midlands Centre for Constructing the Built Environment) Environmental Sustainability Award category. Craig Pygall of Woodhead said: “With 11 other strong finalists, achieving second place on the night was a great accomplishment. The project as a whole was a fantastic achievement for us. We worked really well as a team; the Forestry Commission, the National Forest Company, Pick Everard Architects and ourselves. 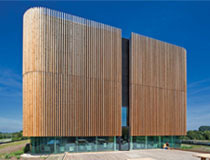 Incorporating Woodhead’s knowledge of green technologies, Hicks Lodge uses sustainable timber throughout, solar panels, a biomass boiler, a sustainable urban drainage (SUD) system in an airtight structure – all design elements which make a significant contribution to sustainable development principles. 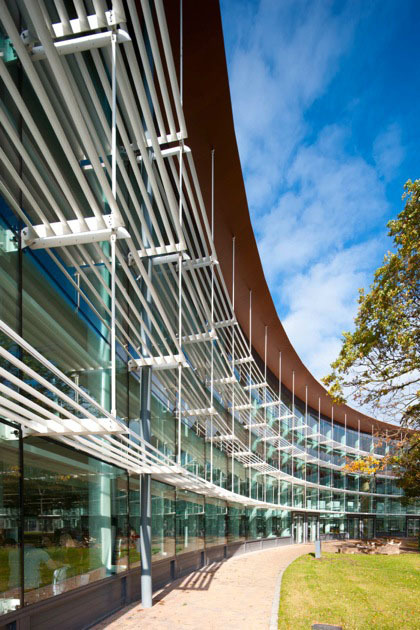 Set in the National Forest the project is designed to BREEAM Excellent standard. Only one site skip was used with less than 3% of waste going to landfill.